The "golden valley" of Sóller - home of olives and oranges "Fet a Sóller"
Sóller is a small town with about 13,500 inhabitants, located on the north west coast of Mallorca, surrounded by the Tramuntana mountains (UNESO World Heritage Site). Sóller same as the communities Fornalutx, Biniaraix and the port (Puerto de Sóller) are in the idyllic valley, surrounded by some of the highest mountains of the island named Puig Mayor, L'Ofre and Teix. 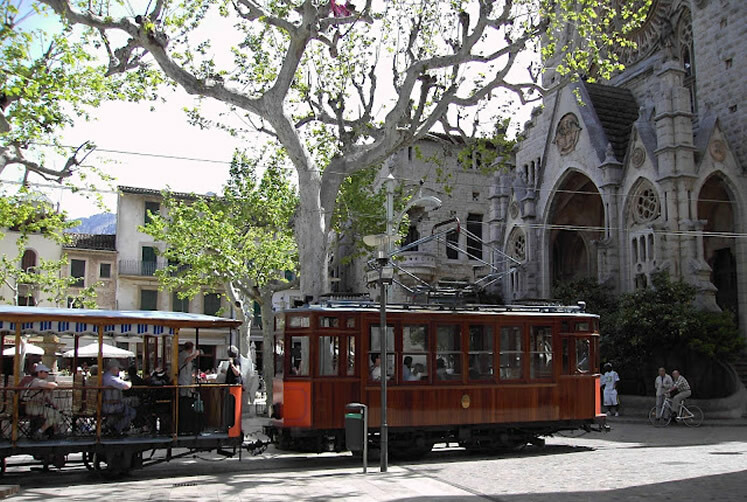 (Webcams in Puerto de Sóller: Paseo Maritimo or great views over the bay)Tourists as well as locals appreciate the exclusiveness of the valley, which so far hasn't been touched by mass tourism, due to its geographical location. Especially nature-loving and active visitors take advantage of the great sourroundings: the Tramuntana offers plenty of attractive walking routes and challenging routes for cyclists, the sea offers any type of water sports. In the Valley of Sóller are mainly growing: olives, almonds and most of all oranges and lemons. That's why it is called valley of the oranges (Vall del Tarongers). All necessary information about Sóller such as the current weather, a map, accommodation, excursions, etc. can be found at soller1.com.